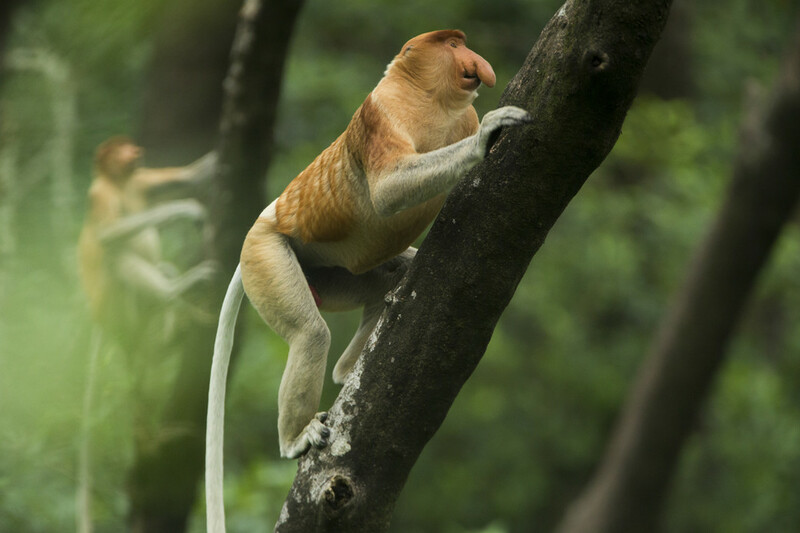 Known locally as bekantan, the proboscis monkey (Nasalis larvatus) is a rather unusual-looking creature endemic to the Southeast Asian island of Borneo. One of the continent’s largest primates, it has a potbelly and a pendulous nose of clownishly large proportions. The ‘proboscis,’ or snout, is significantly more pronounced in the male, where it can grow so long that it must be pushed aside for eating. (The female’s nose is almost daintily slim and tapered by comparison.) 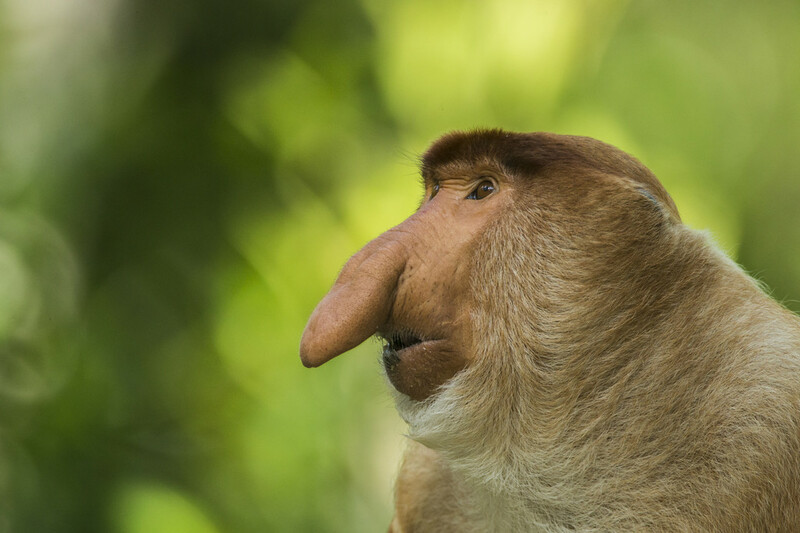 The main function of this oversized organ is to impress females and intimidate rival males; scientists also believe that the large nose creates an echo chamber that amplifies the monkey’s call. The males also have a permanent erection. There is no known reason for this. Characteristics like these have earned the bekantan quite a collection of nicknames among the Indonesian residents of Borneo, whose ancestors endured Dutch rule from the 19th until the middle of the 20th century. One is monyet belanda, which translates as ‘Dutch monkey.’ Another is orang belanda, or ‘Dutchman.’ Both are scornful references to the waistlines, facial features, and perhaps even the conduct of former colonial oppressors. 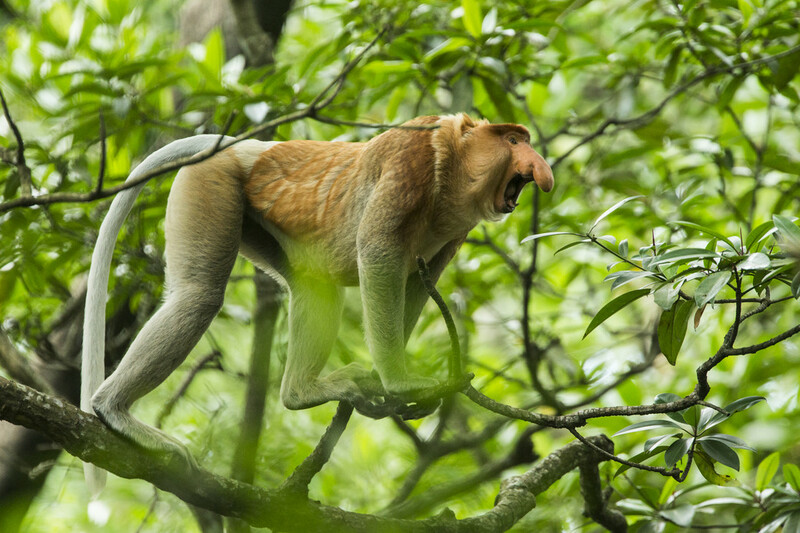 Through no fault of its own, the proboscis monkey has been drawn into the linguistic feces-slinging behavior of Homo sapiens. 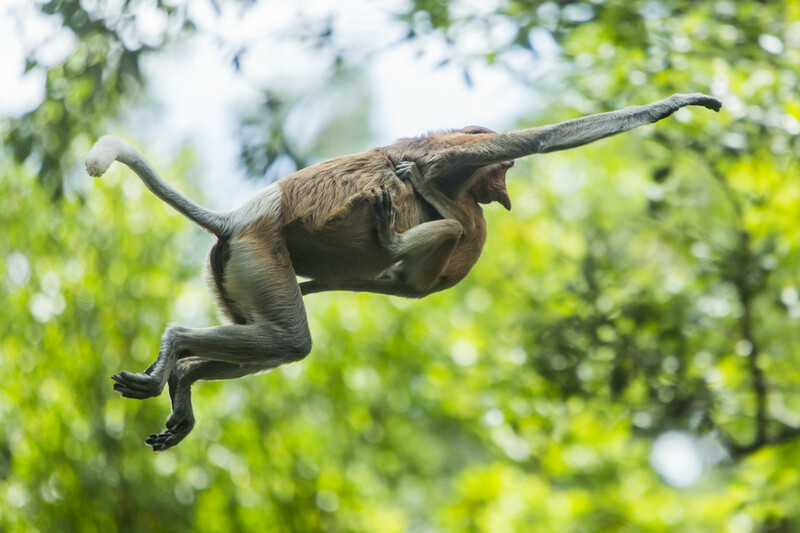 Proboscis monkeys receive less attention than the island’s flagship species, the Bornean Orangutan, despite some remarkable abilities. 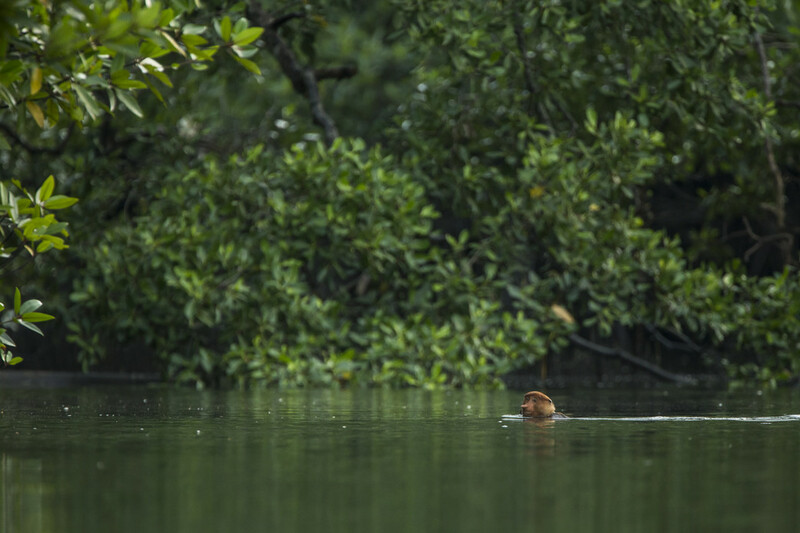 Unlike the hydrophobic orangutan, bekantans are accomplished swimmers, and can often be spotted leaping from trees into rivers and landing with a loud belly flop. They are capable of advancing more than 50 feet (up to 20 meters) while underwater, a behavior that has become so essential that they have evolved webbed feet and hands to help them outpace preying crocodiles. 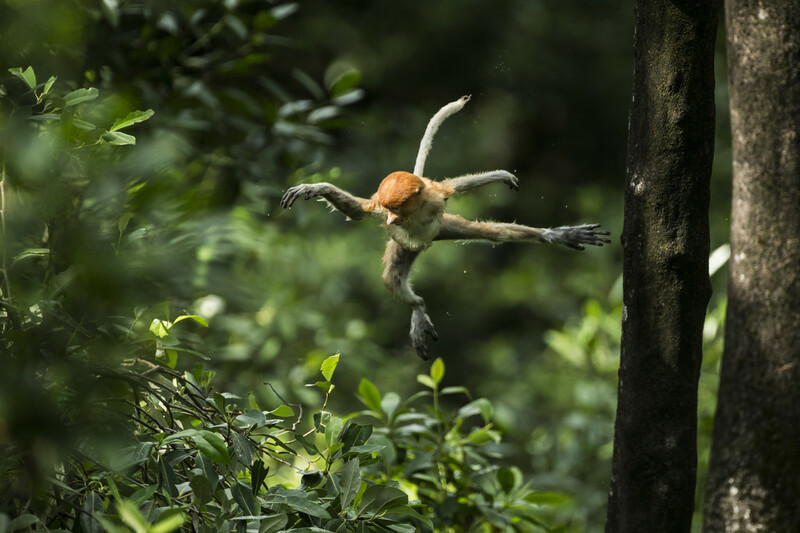 Otherwise, these old-world monkeys are predominantly arboreal and during the day climb and swing through their native homeland of tropical riverine and coastal forest. They eat mostly fruit from January to May and mostly leaves from June to December, but will also pick at flowers, seeds, and occasionally insects. The leaf diet explains their paunches. Chambers in the bekantan’s stomach house special bacteria for breaking down cellulose, making digestion a very slow process. Their bellies are often full, and may contain up to a quarter of an individual’s total body weight. 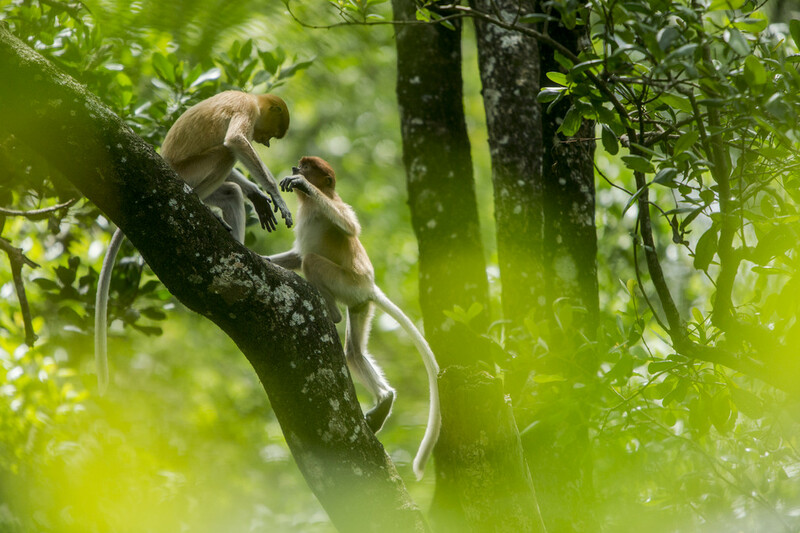 Proboscis monkeys live in bachelor groups or in organized harem groups consisting of a dominant male and two to seven females, plus offspring. (The youngest babies, with their blue faces, are easy to distinguish.) 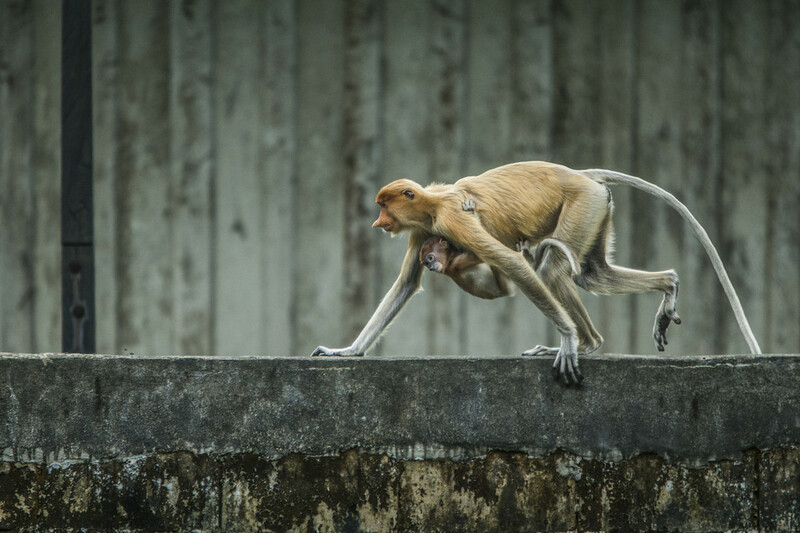 But theirs is a ‘fission-fusion’ society, in which group size and composition changes as primates move through the environment. A degree of fluidity is the norm. At night, for example, separate groups will gather at the same sleeping site. Home ranges overlap and displays of territoriality are infrequent. Under stress, however, that behavior changes. In the northeast, two groups of bekantans cling to existence in the tiny shred of mangrove forest that remains in the growing town of Tarakan. 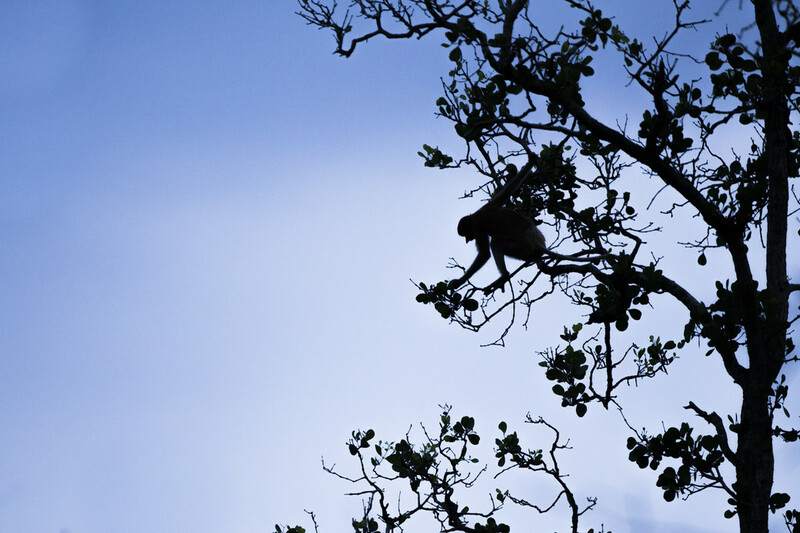 The shrinking home range has forced the monkeys (a harem and a bachelor group) to inbreed and to depend on humans. Without locals providing food, they probably would not survive. The squeezed conditions have led to territorial disputes between the males at the feeding station, behavior that would rarely be seen in nature. 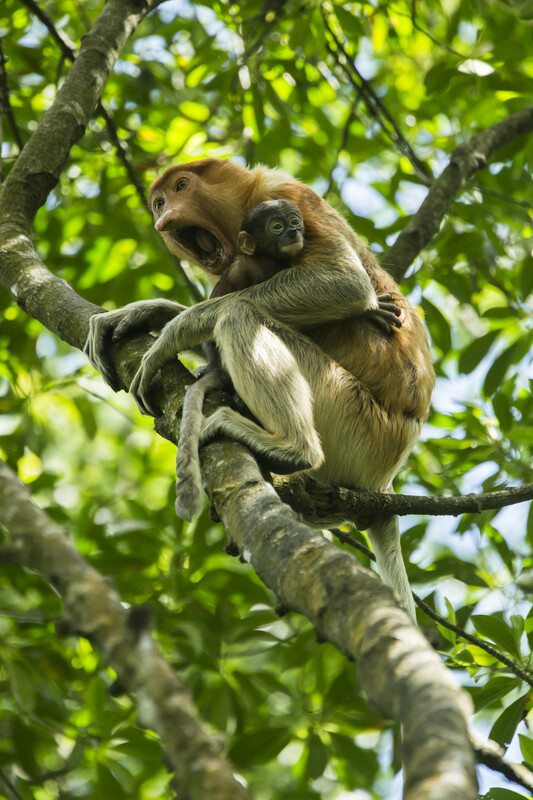 Bekantans were once themselves a food source for humans, and their meat considered a delicacy in Borneo. 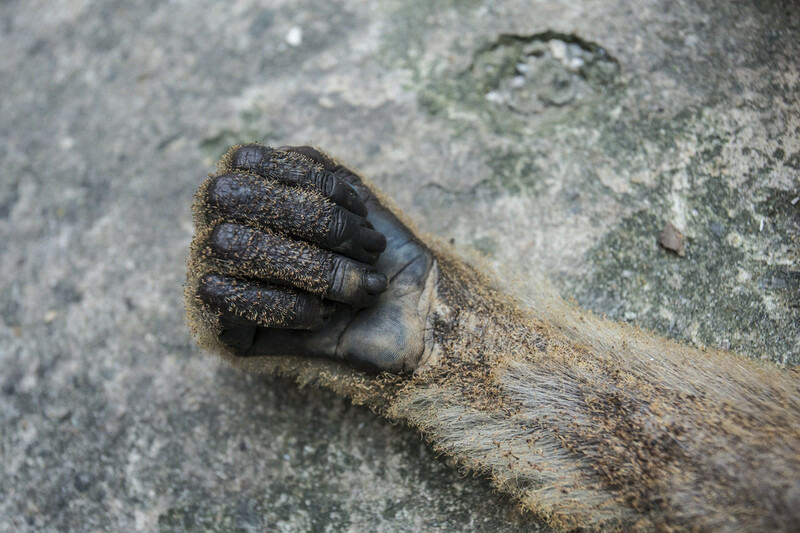 But they are now endangered, primarily as a result of habitat loss in areas like Tarakan and Balikpapan Bay. Their numbers are thought to have dropped by up to 80% in recent decades, from 260,000 living in the wild in 1987 to an estimated 7,000 now. And those numbers are still going down. 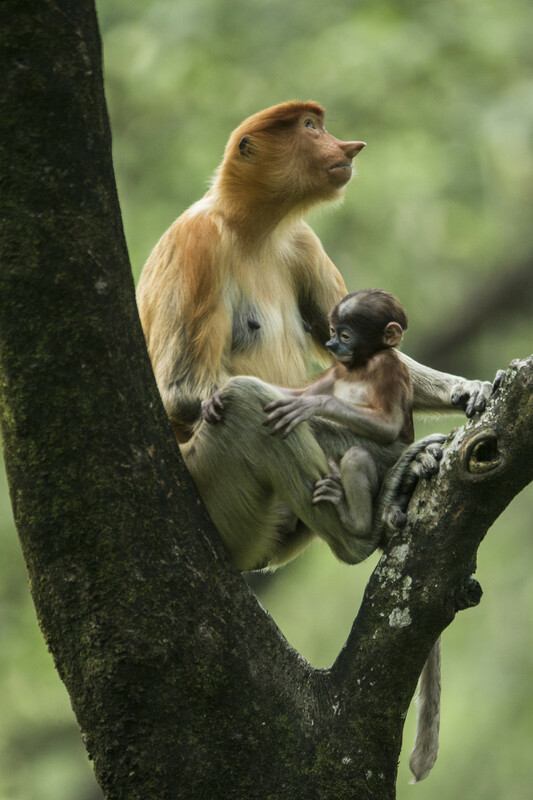 These days, its funny looks are the least of the proboscis monkey’s problems.